Here we are at the end of year.....the very last day. As I sit here thinking about it, I wonder where it went? I know I was conscious and involved in every day but yet, I ask myself, where did it all go? I was recently having a conversation with our six year old. He says to me, Why does dark time come so quick every day? My first response was to quickly tell him that it's purely for the sake of your parents sanity but really, it's because we are so busy at living life, that time flies by without us noticing....at least until I yell out, "It's bedtime" anyway. Then it's obvious that the day has now come to an end. Here we are almost to 2008...but before we say good bye to 2007, I want to briefly reminisce about this past year. 1. I became the proud owner of a cemetery plot. 2. Kara took her first steps. 3. My husband had a mysterious gall bladder issue and removal. 4. My husband's job was sent to India leaving him with a sense of "freedom" and me a sense of panic. 5. We lost a 13 year old cousin to a drunk driver. 6. We started a business. 7. Ryan lost his first tooth. 8. Ryan asked Jesus into his heart. 9. My Mom left our nest to explore other opportunities abroad....like bingo night and skip-bo with the gals. 10. Grace got her pink room. 11. We got a new dishwasher. 12. We became relative foster parents to two little girls. 13. Grandma Adelia passed away at the beautiful age of 93. 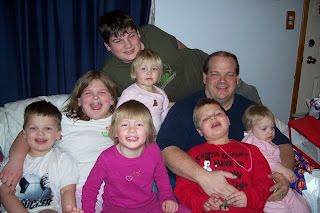 2007 also brought a year full of birthday celebrations and lots of living in between. We pray that your 2008 is full of hope, full of happy memories created with those you love, and one full of God's peace. Today was my husband's birthday. It's funny when you get older. Sometimes your birthday is just like any other day. Kind of like some of our dates. I remember when it use to be so romantic...holding hands and being all kissey-faced. After 14 years, five kids and two new additions, sometimes a date consist of Costco and Starbucks. I suppose I should be grateful for an uninterrupted trip to Costco and by all means, the Starbucks is a treat but I do reminisce about the good ol' days. Bob went to visit his Dad who happens to be in the hospital and then he went to Meijer's for me. How fun is that on your birthday? He is a dear and very precious to me. He tries to keep my kitchen clean because he sees me working so hard at keeping the laundry pile down and figures that is a full time job. I think he also knows how very much I hate doing dishes. He goes out at Midnight to get milk so we have it for cereal in the morning.....he's always looking for ways to help his family. I want you to know, dear, that all those things never ever go unnoticed. I am so very grateful for you and I hope you know how very much you are loved. Can you believe the whirlwind of Christmas is already over. 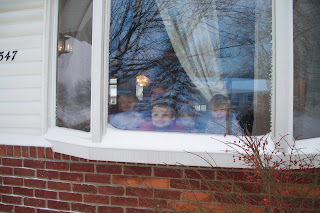 It seems like from Thanksgiving on, there is such a flurry of activity (or maybe that's just my children bouncing off the walls) that by the time Christmas is over, I kind of feel like there is something missing. I wish you could hang on to the Christmas excitement and wonder but I suppose you do need some down time. Maybe I wouldn't like it if the kids were going bonkers all the time. We'd never get an ounce of a sane moment. Boy, I just slapped myself back to reality. I do value my sanity...highly. When I look around my living room, it shows that Christmas did indeed happen. It may look like a tornado hit but I'm sure it was just the most exciting holiday of the year crash landing right here before me. We had such a fun time watching the kids open all their gifts. Kara was such a cute little thing to watch as she tore threw that wrapping paper to find what was underneath it. She's a maniac when it comes to opening gifts. None of this gentle tearing of the paper for her. Sharlene was so fun to watch too. She thought that every gift she got was for her birthday. It kind of reminded me of the cartoon movie, Frosty the Snowman, when he says Happy Birthday every time the magic hat sits on his head. I'm still not sure she understood that they were for Christmas. I'm sure she'll catch on pretty quick. The other kids will fill her in on how it works. We had a couple special blessings happen this year. Some ladies from my Mom's church blessed our family with gifts. As the packages were opened with glee, it was as if God helped them pick out each item. Aaron exclaimed, "How did they know I wanted these!" We also received some other wonderful gifts that hold me speechless. God blessed us beyond anything I ever imagined. That's what Christmas is about. Sharing God's love. It may be in the form of a gift, it may be in the form of a hug, or a note. We truly saw God's love through so many different avenues this Christmas. I pray that your heart, too, has the opportunity to see HIS love in action. It's so amazing. I don't know about you but we spent a pretty penny on video's back in the day. 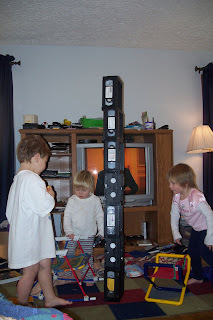 Especially when we started having our family, did the stacks of videos start piling up and since everybody has their favorites, we are talking TALL stacks. Now we have DVD's piling up. Although, they aren't as bulky as the video's. It's like the old computer monitors....they are so b-u-l-k-y. I love my slim flat screen monitor and am looking forward to someday replacing our b-u-l-k-y TV with one of those fan-dangled new jobies. Our VCR hasn't been in good working condition for a long time now and has long since been lost under the six feet layer of dust. But the 'tall' stacks of videos lined up in a row under the entertainment center look oh, so very lonely. My husband had suggested once that we copy them onto DVD's but that would entail getting some new equipment which just seems silly in my mind. Therefore, we have a collection of videos with no current purpose. I've asked myself on many occasions why I keep them. I suppose because they cost lots of money at one time even though now you could probably have all of mine for $5.00 total and that is stretching it. I suppose if I keep them for another 20 years maybe they'll be considered antiques? Or perhaps they'd make a good show and tell to future grandchildren. 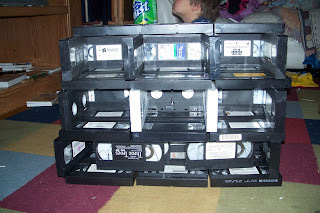 Back in my day, dearie, these here video tapes were what we watched on that old color tv that took up 36 whole inches. Can you just imagine that? After catching myself from yelling at the kids to not play with those, I realized what a fun time they were having. They built towers, doll houses, and each had their own room sectioned off with those wonderful new toys. Hours and hours of fun and creativity have been had by those newly recycled toys. Kara even pulls out the tape on a couple just enough to make a purse in which she carries around on her shoulder. Again....can you just imagine that? They say we may end up with six more inches before this evening. I got five calls this morning telling us that church was canceled. I don't ever remembering that happening. I have to tell you that I'm a bit relieved. Even though I wasn't really sure we were going to go because four out of the seven have green snotty noses, the thought of getting everyone dressed, matching boots found and oh, then there is the mittens.....it's just too much to think about before my sixth cup of coffee. I think my favorite weatherman, Chuck Gaidica, announced it was a snow pant emergency this morning. The kids are itching to get out there. They might have to wait a little bit though.....I need to do some laundry so they all have clean pants. If I wasn't so embarrassed about my laundry pile....I might be tempted to show you a glimpse of it. I'll have to think about that and get back to you on that. When I was a kid, I couldn't wait for moments like this when there was a dumping of snow. Of course, it was even more exciting when it happened to be on a school day but nevertheless, still very fun. I can feel the excitement oozing from every area of my home. Aaron woke me up with a "holy cow"....it's all buried out there. The kids keep running to the window to check it out and to make sure it's still out there. I'm afraid it isn't going anywhere anytime soon. As I was watching the news this morning, they showed the line-up of people in front of Best Buy around 6 a.m. to hopefully get an opportunity to purchase the new shipment of Wii's despite this nasty winter storm. That is dedication right there, people. My children are going to have to settle for sending their pleases to the Easter bunny. You never know. Always remain hopeful, I say. Winter is definitely here. We might actually have a white Christmas this year. 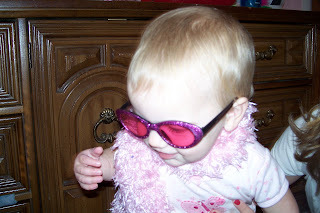 They have the cutest clothing items out there for little girls. It doesn't help me one bit that I think Kara is a beautiful girl. Can you tell I'm prejudice? We recently went shopping at the mall and what do you think I came across? 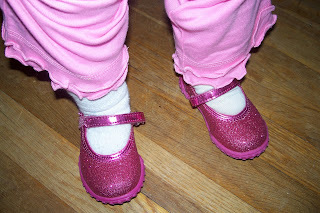 The most adorable pink shoes that sparkle like the eyes of my 19 month old. She already has two pairs of shoes I told myself.....but I ended up purchasing them anyway because they reminded me of her. She took to them as quick as a wink and hasn't given much thought to her other shoes. 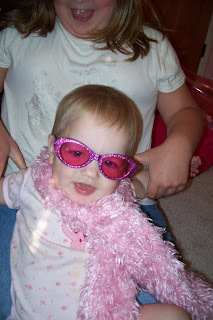 She now brings me these shoes whenever she has an inkling that she might be going bye-bye. I sure wish I could find some for myself.....oh to be a little girl again. 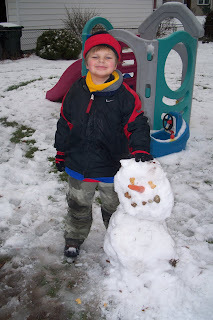 Last year we got a big snowfall early in the season to which Ryan begged and begged for one of his parents to go outside and make a snowman with him. For the life of me, I can't remember the reason why I put him off....maybe because it was cold out there or maybe it's because it takes me an hour to find all the accessories the kids need to go outside in the cold only to have them done with all that fun in just five minutes flat. That's just enough for me to procrastinate. So we passed on the opportunity to make the snowman BUT I did promise that I would with the next snowfall. Well....that never happened. Everytime it snowed, it was either the really light, dusty, fluffy snow that will not pack into a snowball or it wasn't enough to make one bigger than a pine cone. This dear child of mine has not, for the last year, let me forget that. Even in the middle of 90 degree weather, he had not forgotten for one second that I promised him I'd make a snowman with him and I didn't. He just would not listen to reason. He spent the entire year muttering about when the snow fell this very next time, that there would be one mother and one son outside making that very important snowman and it was going to be F-U-N. Of course, the mother was muttering about what she could do with the snow when it fell this very next time but I suppose that wouldn't go down in our family history as one of my finer mother moments. Well, as many of you know, the snow has fallen and it was just the right kind....wet snow that packed into a wonderful snowman. Ryan was the happiest kid around. The moment had finally come. We happened to have a carrot for his nose. 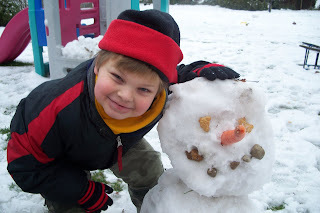 He tried using animal crackers for the mouth and eyes but the wet snow kept making them into a sort of paste which was frustrating him so we found some rocks and then it happened. Ryan had his snowman. It's interesting how God reveals himself. I was feeling very discouraged with Sharlene and Barbara and the diagnosis we had been given from the mental health facility. Actually, to be truthful, I was feeling quite angry. God doesn't promise that the things he asks of us are going to easy or that if we are willing to be obedient, that he'll just reach down and make the road free of debris. Sometimes it's just plain ol' h-a-r-d. Sometimes, when He asks us to do something, disappointment and frustration appear because it's not quite what we had in mind. Expectations. But I expected....well..no, maybe I didn't know what to expect but I didn't know what we as a family would go through or the emotions that this experience would reveal in myself. Have you ever been in a situation that reveals your character in the mirror and you don't like what you see? That's me. I've seen selfishness, irritation, a lack of mercy and forgiveness and where or wherefore art thou, my compassion? I have to ask God every day for forgiveness of my attitude and my selfish desire to be done with such a hard task. The desire of my heart is to be full of compassion, quick to be merciful and forgiving, tender-hearted. To, without question, be obedient to what God has placed in my care. So why, even though my mind knows what to do, is it so incredibly hard to get the rest of me in agreement. So I'm sitting in church a couple weeks ago listening to the sermon which seemed to be only for me. A couple points still haunt me today. You have to get out of your house or your cushy life and let God use you for a hurting world which include something dear to God's heart, orphans. Could you go to heaven knowing you turned that opportunity down? I happened to get a email which was from Dr. Dobson's site. 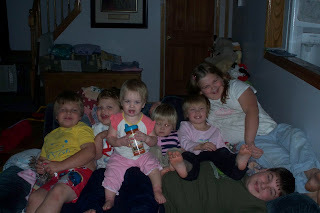 It was on orphans and how precious they are to God. I sat down to watch a Christmas movie. Care to take a guess what it ended up being about? Yep...taking on the care of three orphans. Ok, so I get it, God! You've got my attention. God wants us to continue caring for our two little orphan girls no matter what the struggles bring daily. He doesn't want me to have clarity in this situation yet but instead, He wants me to just have faith and trust in Him to work this all out. He keeps reminding me of this whenever I turn the radio on or I happen to drive by a billboard. He promises to not give us more than we can handle and always provides an open window when it gets to be more than we can bear. In this situation, the words....'you are that window for Sharlene and Barbara' have been whispered in my ear and in my heart. How can I argue with that?